YOU CAN HELP SEND CHILDREN ON DETROIT'S EAST SIDE TO DAY CAMP THIS SUMMER! Sponsor a child today by clicking on the link below. Add DAYCAMP2017 in the comments section of your payment details. Thank you for your partnership! Interested in More About Summer Day Camp? Drop us a line, and we'd love to share more! Every summer, LifeBUILDERS offers a four week day camp for children in the Regent Park community. During this time, 80 children experience interactive story time, learn memory verses, and get to choose from multiple elective workshops. This is not only a great time for the kids, our youth enjoy it as well as we employ twenty jr. high and high school students from our community to serve alongside our volunteers! Summers are a BIG DEAL here at LifeBUILDERS! And most of all, an experience of the Love of Christ! The challenges faced by the residents of Regent Park are far greater than can be solved by city or state government and are far too great to be ignored. Our strategy is to empower the youth, make strategic investments to reduce the blight and abandonment and its effects on the lives of families and to build a strong community through resident engagement and shared values. We further believe that this can only be made possible through the extension of God's love and grace that is found in Jesus Christ. Our mission is to restore dignity and provide hope to the residents of Regent Park, a Northeast Detroit neighborhood. This is accomplished in three ways: by empowering our youth with life skills and providing opportunities to grow and learn in a safe environment, by reclaiming an entire neighborhood from the effects of disinvestment by providing high quality affordable housing, and by building a community of shared values, trust and hope for the future, all grounded in the truth of God’s Word. 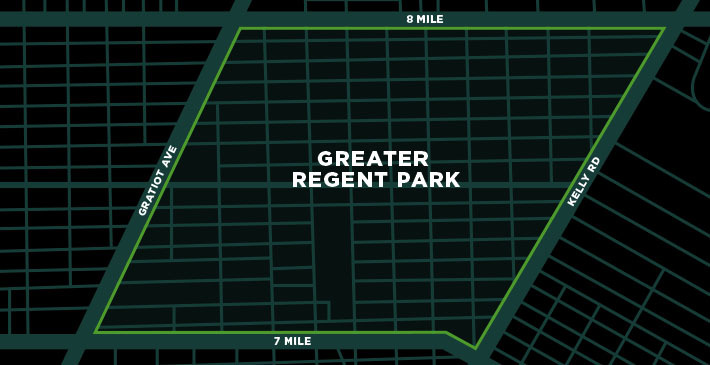 Decades ago, Regent Park was a thriving, working-class neighborhood in northeast Detroit. It was home to many of Detroit’s firefighters, police officers and teachers. It was a 97 block neighborhood comprised of nearly 2000 homes filled with families and seniors. It boasted two public schools that brought education and opportunity to the neighborhood’s youth. In recent years, Regent Park has become known for its poverty and hopelessness. restoring hope, dignity and opportunity. Decades of disinvestment has plagued the community. The quality of educational alternatives, availability of safe, affordable housing, and even access to healthy food choices and good jobs has diminished along with public safety. Over 20% of those homes have been abandoned or occupied by squatters and often drug dealers. The greater 48205 zip code which includes Regent Park has been recognized as Detroit’s deadliest neighborhood. The two public schools are now boarded up and the high school graduation rate is about 40%. Despite this decaying environment, the neighborhood is still teeming with children and youth. However, the hope and opportunity has faded.